Happy! Happy that my folks are here from out of state visiting for the week. Happy that I have a clean house. Happy that the boys are happy! I have two cards to show today, both featuring the fun embellishments that were included with the June Artful Delight kit. 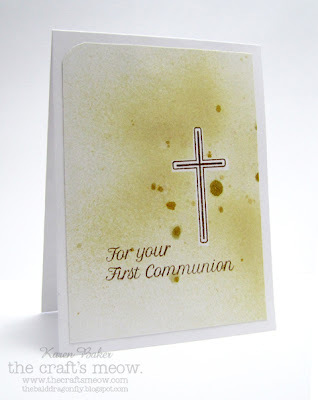 Did you see the July kit?! Ah-mazing! 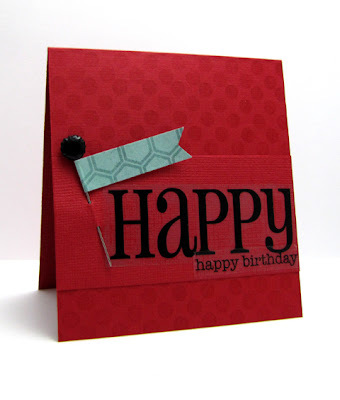 Happy, Happy Birthday features an altered stick pin (it was blue and I covered that color with black enamel accents). 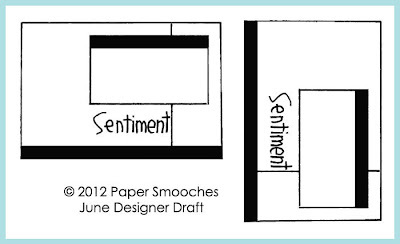 The paper, pin and Paper Smooches Goe-Graphic stamps were all in this past month's kit. (The stickers, SRM, were from my stash.) Love the paper, it has a textured side and non-textured side, so I also played that up here. 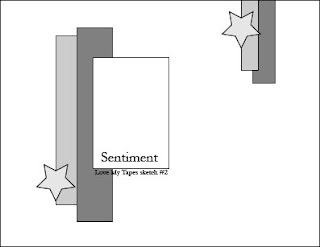 I was inspired by the Paper Smooches latest Sparks Challenge. And then for the below card, I used the lovely textured white Bazzill paper, a piece of paper from the 6x6 pad and the fun ribbon from the kit. I looped it a couple of times and stapled it to the sentiment and adhered it all to the card. Husband: Hey, come here for a minute. Curious, I got up from the computer and went over by him-he's so much better at hearing the words to songs- and we listened to this song. 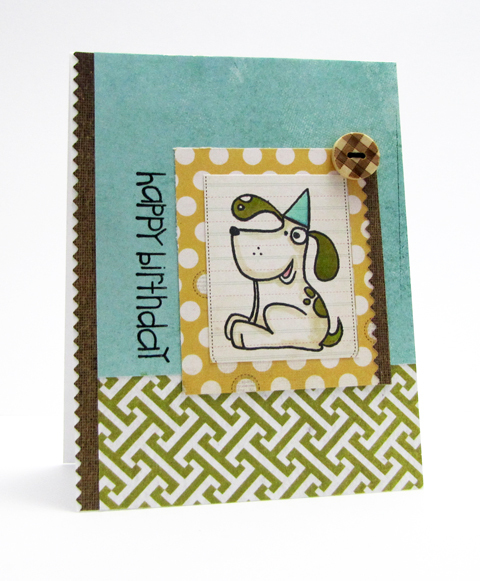 It's Tuesday, and that means a brand spankin' new sketch challenge is up over on the Skipping Stones Design Blog! Stop over to read the challenge rules, prize information and cool, fabulous examples from the guest designers and design team. We are featuring Margarita Birthday today, so I went with an old school look and inked up the fun glass with some vintage photo ink, lightly colored it and added some glitter glue for the salt. The script from Garden Kiss was added to the focal image. I'll admit that the banners in the sketch scared me, so I opted for a more simple approach with a patterned paper banner and some twine. Now is a great opportunity to play along with the sketch and send your creations to this wonderful cause- Hereos Card Drive! You can find more about Heroes Card Drive here. 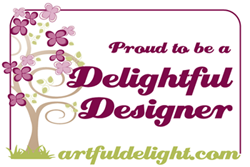 I could go on and on about the benefits of subscribing to a kit, especially one like Artful Delight's card kit, but I seem to be running short on time this week so I'll spare you. Just know that you certainly get your bang for your buck, and each kit contains so many elements. 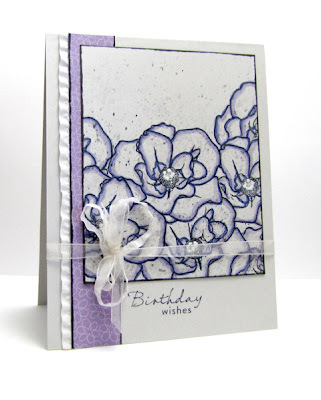 Trying my hand at two masculine based cards today that feature the solid card stock in the Artful Delight June kit as well as the fun patterned paper. Short and sweet today, hope you all have an excellent weekend! My card today features three stamps from the new release. 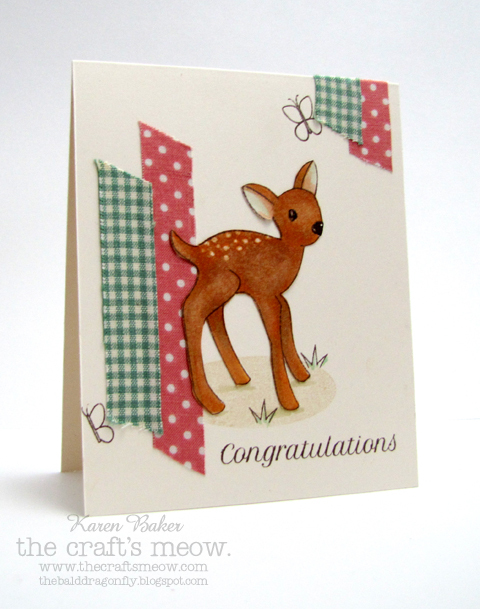 The adorable fawn is from Oh Deer, the lovely sentiment is from Lovely Labels 14, and the scroll from God's Blessing. 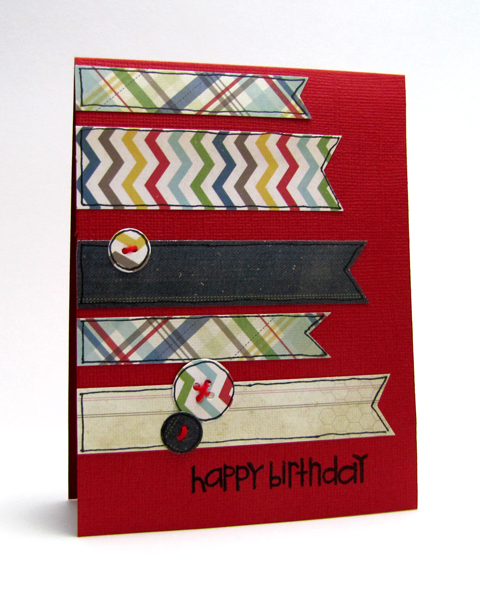 Three different designers created the stamps, but I love how they work so well together! A few amazing details about this release. Summer Fun is June's Gift with a $50 purchase. That means that last month's Typically Teen is now available for purchase! Yay! You can be eligible to win all 6 of June's releases from The Craft's Meow by simply commenting on each blog on the hop. Easy peasy, and I promise, there is great eye candy! The deadline for commenting is Sunday, June 24th, so you have plenty of time to make the few stops. A complete listing is found on The Craft's Meow's blog should you loose your way. Your next stop is Lindsay Amrhein! I've got a quick tutorial up over at the Skipping Stones Design Blog for Tips and Tricks Thursday. 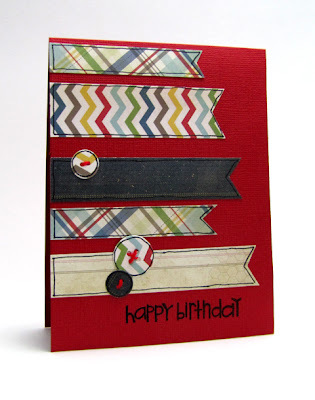 If you are frugal with your ribbon and save all the scraps like me, it might be worth checking out! The final piece was inspired by the shoe over at Runway Inspired Challenge. 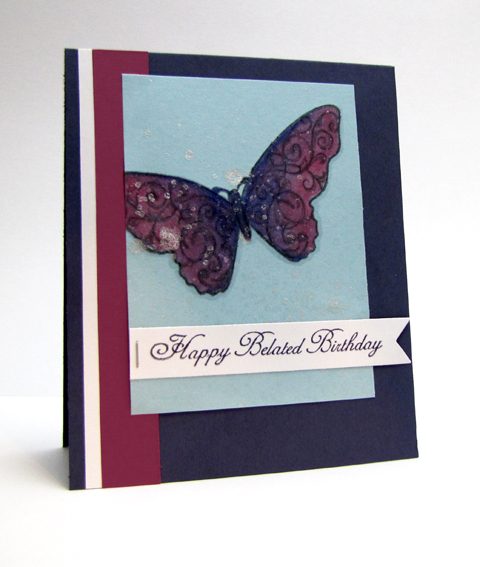 Loved the colors, the color blocking and shine, which I've attempted to achieve with layered ribbon tabs and some misting. Yep, I have a fascination with Shine Mist. 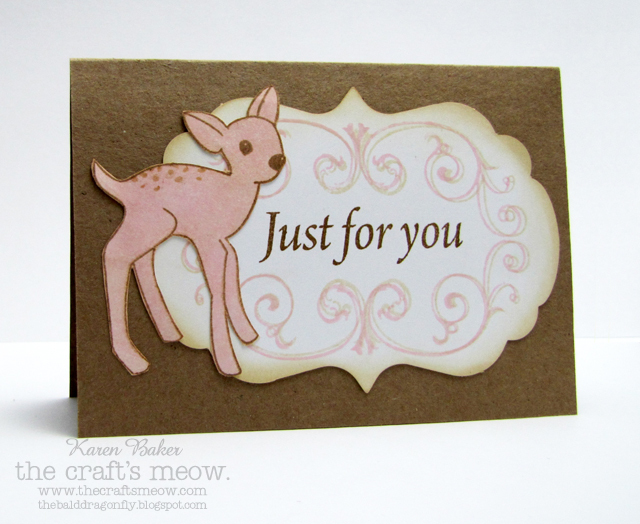 Today I am happy for my friend and teammate, Aimes, as it is her debut of her first designed set, Oh Deer for The Craft's Meow! What an incredibly cute set! Congratulations, Aimes! So glad that one of your dreams came true! This next card is a bit of a whimsical take on the second set being debuted today, Summer Fun by Katilyn Ord for The Craft's Meow! 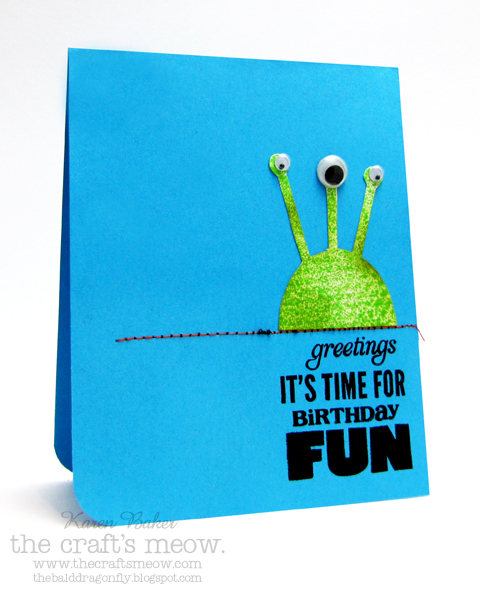 I wanted to showcase how you can stretch this stamp set and utilize it beyond summer so the little martian is actually the bottom of the grill turned upside down with a trio of googly eyes added! 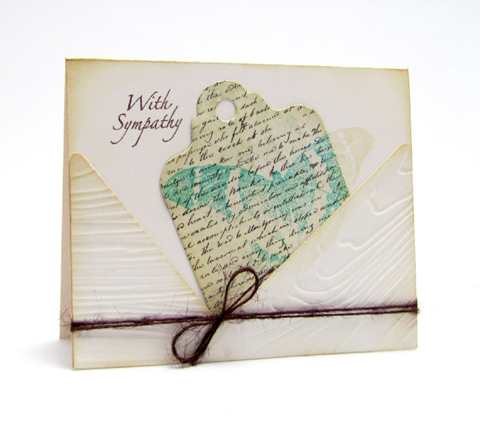 This sentiment is a mix of a fun and bold one offered with this set, one from Stitched Sentiments and Vintage Rides. Summer Fun is July's free gift with a $50 purchase at The Craft's Meow! Please stop by The Craft's Meow Blog for links to the fabulous designers, illustrators and guests, Larissa Heskett and Gayatri Murali, and to find out how you can win these two sets before you can buy them! This is my third post today! Gosh, it's a busy day here at The Bald Dragonfly! Kind of is a lot like that in my family life too! This week at Skipping Stones Design, we have a really fun sketch for you to try your hand at. I took liberties with it, but I really like the end result. 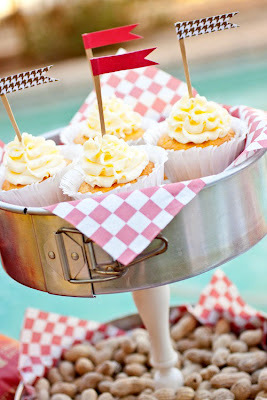 Can't wait to see what you come up with...check out the details about the challenge and great inspiration on the blog! 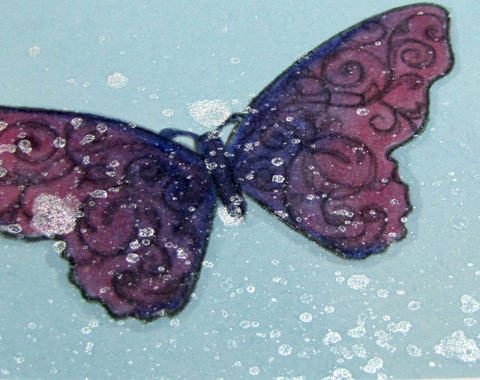 I started this design by stamping the beautiful butterfly from Always Here onto light blue paper and then coloring it in with markers. 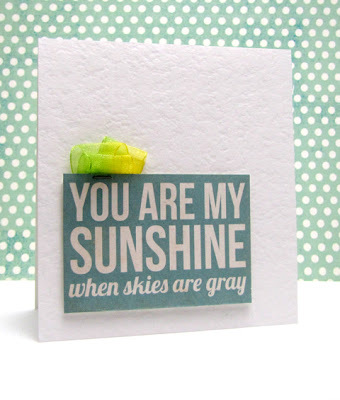 I thought, after assembling the other parts of the card (the sentiment is from a set that hasn't been released yet!) that as a focal image, it needed something else. Therefore I added a light spray of shining mist. 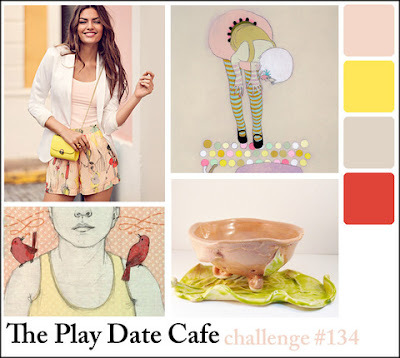 The colors are derived from the absolutely amazing color combo at The Play Date Cafe. Did you read that The Craft's Meow has added two new stamp designers to their line-up this month? What a way to offer versatility for all crafters by offering up a wide variety of stamps. Today the design team and other illustrators are featuring the debut of Lovely Labels 14-the first set designed by Elizabeta Kushner for The Craft's Meow! It might be hard to believe (yes, I'm talking to you, my wonderful husband!) 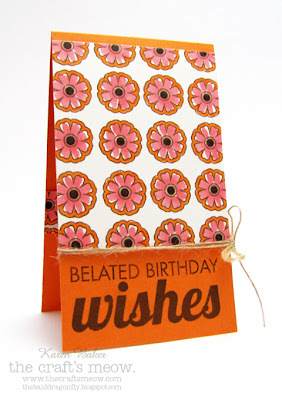 that I do not own the Labels 14 die, so I decided to focus my efforts on the cute flower stamp included in this fun set. 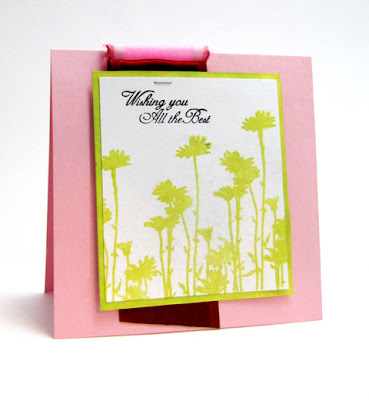 I stamped it in a grid pattern and then colored the flowers loosely with marker. 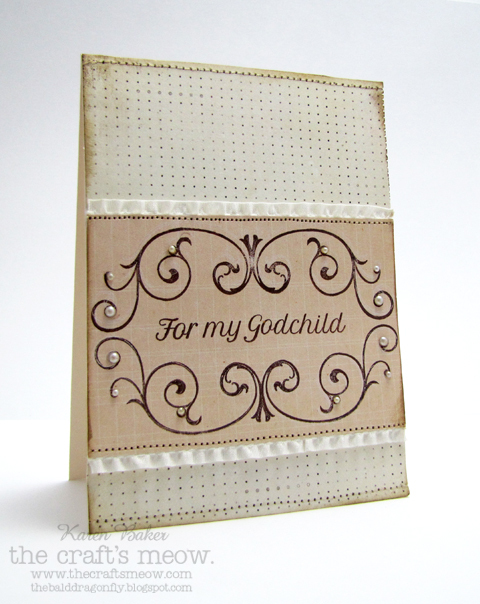 The panel is adhered to a colored card stock base that has been stamped with a fun sentiment from Retro Foundations. I brought the pattern to the inside of the card as well and created a pocket to house a gift card. Please stop by The Craft's Meow Blog for links to the fabulous designers, illustrators and guests, Larissa Heskett and Gayatri Murali, and to find out how you can win this set before you can buy it! 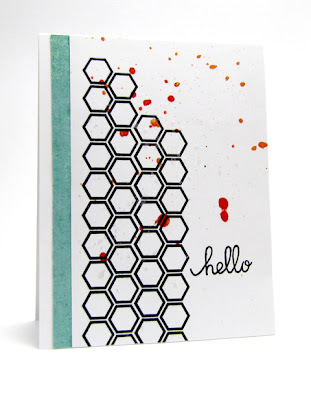 May Arts has teamed up with Graphic 45 for a fun and fabulous week of inspiration. (The complete week long list of participating hops can be found at the bottom of today's post, as well as yesterday's participants!) 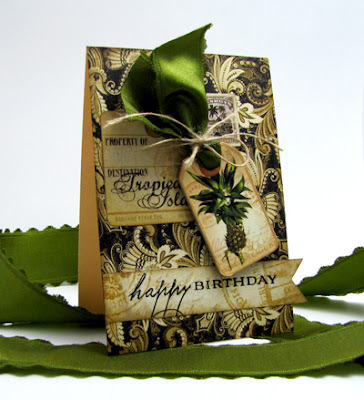 I decided to pair the fun chipboard tags from Graphic 45's Tropic Travelogue collection with various May Art's satin ribbon. 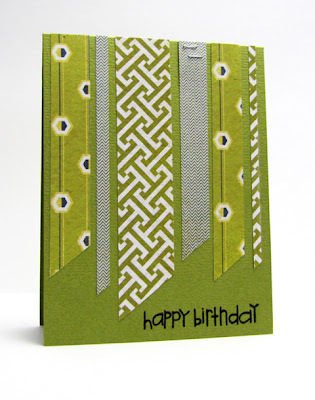 The above card features May Art's Satin Ribbon with Scalloped Edges in Green (EN16). 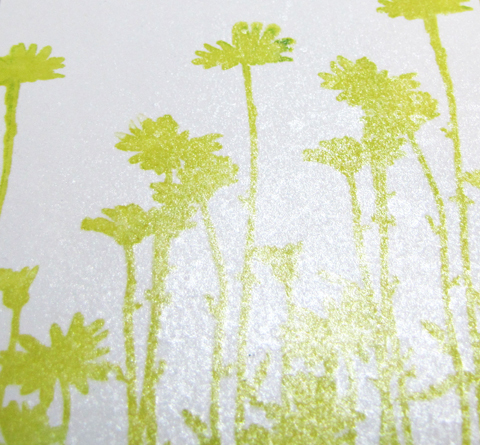 It is lush and thick, and there is a touch of whimsy with those edges! The glorious color in this ribbon matched perfectly with the pineapple greens in the tag. 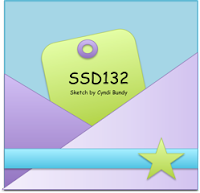 To attach the ribbon to the tag, I tied it with a staple here in my craft area, May Art's Natural Burlap String (SM10). 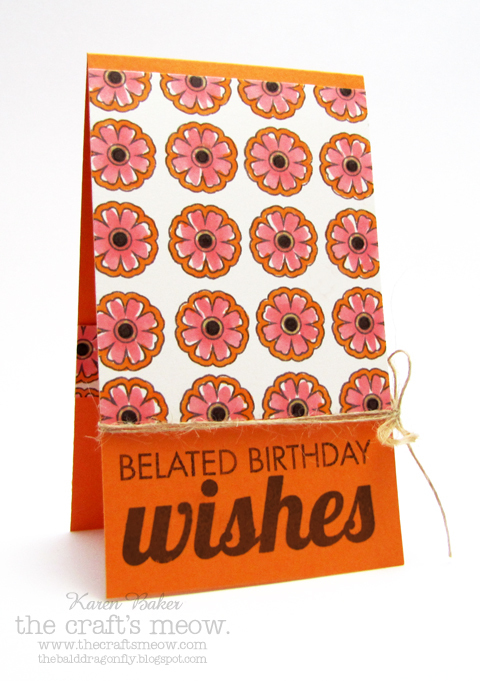 I cut a large piece of Tiki Voyager paper and fussy cut some pieces from Exotic Destination paper to finish the card. This next card is for a newly married couple. 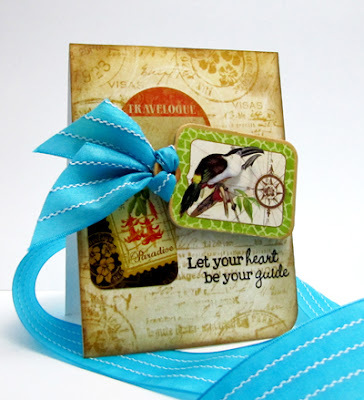 I was drawn to the chipboard tag featuring a pair of birds and a compass. 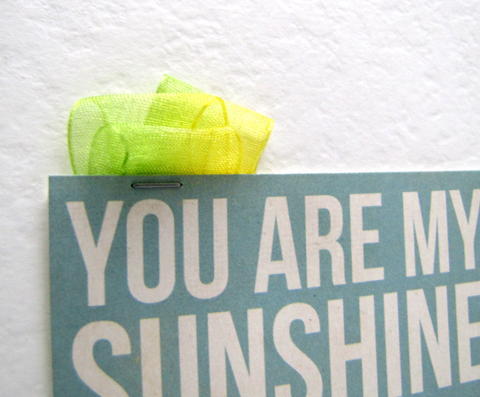 I paired the tag with some bright, pretty May Arts Solid Center/Stitches Satin Ribbon in Teal (380-15-94). The background of the card features the Exotic Destination patterned paper and a few sticker elements from the Graphic 45 collection. 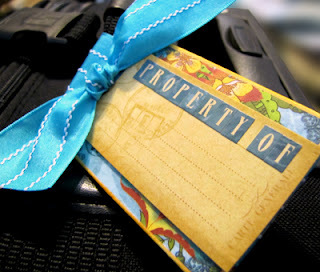 I had so much fun putting some tags on cards that I thought to make a functional luggage tag, after all the papers from this collection called for it! 1. I sanded and inked the edges of a chipboard tag. 2. Taking a length of the teal ribbon, I wrapped it around the tag, gluing the ribbon to the tag towards the bottom of the front and back of the tag, but not the edge itself. 3. I covered the back of the tag with some fun patterned paper from the collection and sanded the edges, covering the exposed ribbon. 4. 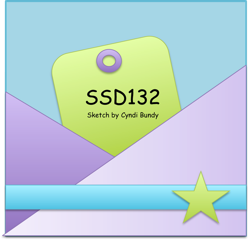 For the front of the tag, a sticker covers the ribbon. Tie all to a suitcase with a knot! I hope you liked my projects today, follows is a list of all the participants! Today marks another fine day, and what better way to spend it than showcasing another set to be released this month from The Craft's Meow?! Nina B. designed a pretty set called Stitched Flowers and there is a fun coordinating sentiment set called Stitched Sentiments! 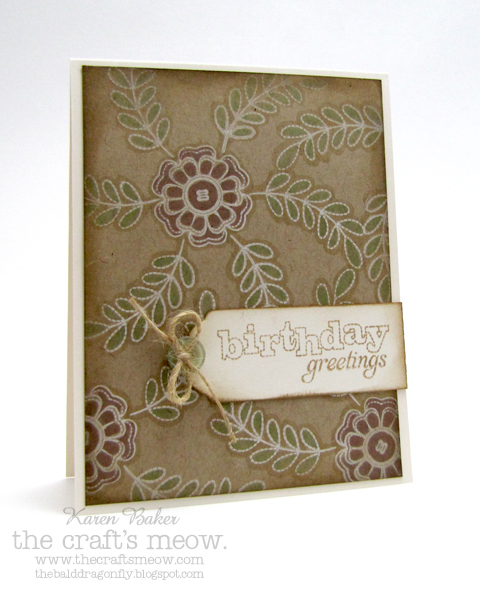 I started the card by stamping the flower medallion and coordinating leaves in a loose pattern with white craft ink. After heat setting, I colored in the images with some soft shades of markers and then inked the edges. I really like this technique! Ooh, what an exciting week this is going to shape up to be! Today marks the first day of sneaks for The Craft's Meow June release! God's Blessing was designed by me, to fill the void in this industry for projects featuring some major milestones in life. 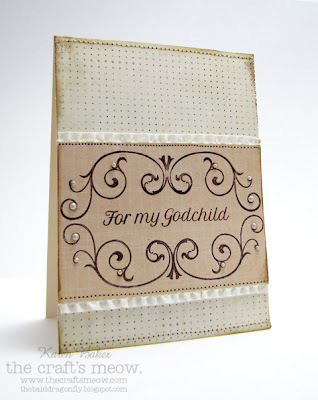 It features beautiful sentiments set in a beautiful font, plus a cross and a scroll work image. I'd love to hear what you think of this set! Stop by The Craft's Meow Blog for links to the fabulous designers, illustrators and guests, Larissa Heskett and Gayatri Murali, and to find out how you can win this set before you can buy it! The oldest (as he is jumping on the trampoline): Mama, Chase let me babysit his toad. Me (with a skeptical, almost nervous response): Oh yeah? Where is it? The oldest (as he pauses from his jumping): He's right here. Me (with a skeptical look on my face as I see him picking up the toad from the trampoline! ): Oh Cole, why don't you let Chase watch him, toads can do their own jumping on the ground. A little bit of time goes by and we begin a conversation again. Me: Cole, where is the toad? Cole: Chase has got him. I made a fun card (for me!) 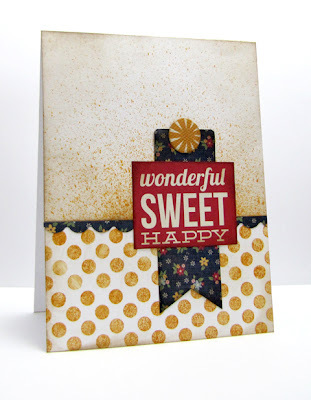 that showcases the wonderful mix of patterned paper available in the Artful Delight June Kit. Everything but these particular stamps and the pinking shear die came from this month's kit! 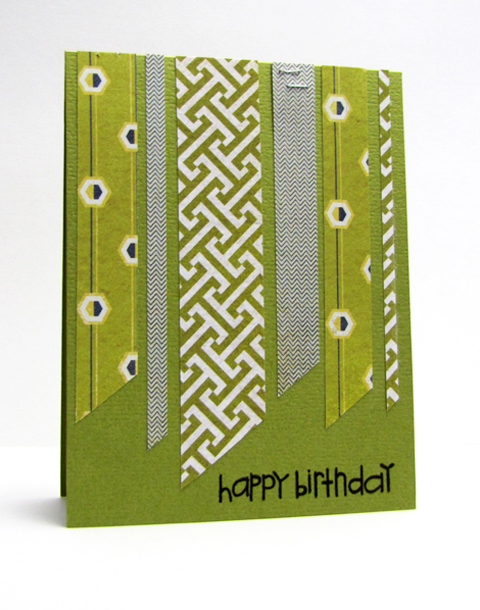 Isn't that patterned paper divine? The green and blue are from the PB&J line from Basic Grey. Love that the kits stretch me out of my comfort zone. I also used this week's Paper Smooches Sparks Challenge Sketch as an inspiration and am joining in on the inspiration at Basic Grey Challenge: CAS. and those that surrounded you with beauty and unique spirit. knowing that your their presence lives on in your heart and guides you. Welcome to the Skipping Stones Design Blog Hop, celebrating the release of the newest set, Breathtaking Butterflies and this week's sketch challenge. You should have arrived from the blog of this month's guest designer, Connie Mercer! All the details on the challenge as well as hop information can be found on the Skipping Stones Design Blog! Your next stop on the hop is Katie! Sometimes the littlest of things can make me misty eyed... Like seeing the boys play for an hour with trucks in the fort they built, or watching my old dog limp-wondering how long he'll be with us but thankful he's still around. Could be something as little as a quick email from a friend, checking up on me. Today on the Artful Delight Blog, I offer some tips and tricks on spray misting! I'd love for you to go check it out. These two cards feature items from the June Artful Delight Card Kit and the Mr. Huey Spray Mist available at the store (they also are now offering the new seasonal distress ink from Tim Holtz!). Remember to create a project with either the scrapbook layout or card sketch for your chance to win next month's kit. Details are here! 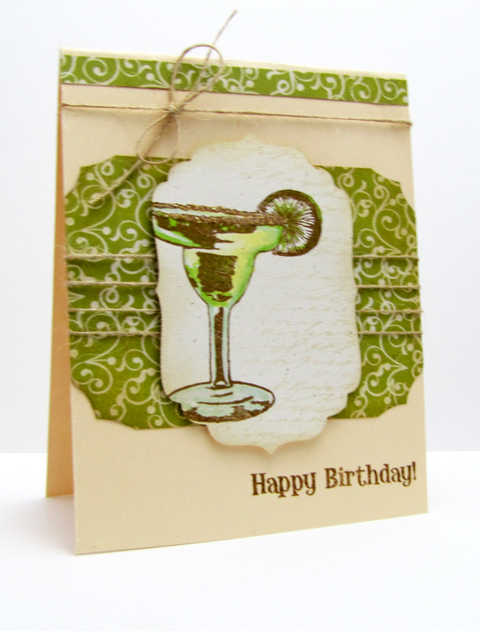 This week May Arts has teamed up with Lawn Fawn! 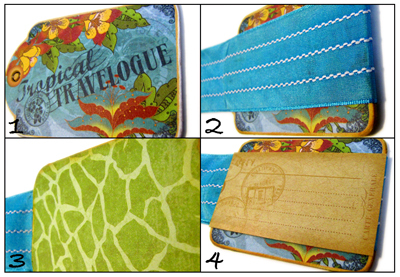 Stop by the May Arts blog for your chance to win products from both companies! Tuesdays can be fun, you've gotten through Monday, tomorrow is the middle of the week. It's kind of like Tuesday is just a day to hang out. 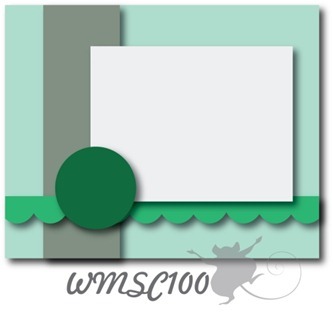 And, to play at Skipping Stones Design too! 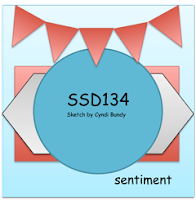 There is a great new sketch for this week, designed by this month's sketch artist, Cyndi Bundy. 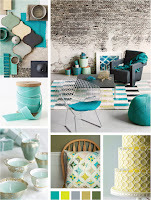 Stop by the blog for more details and fabulous inspiration from the design team member and June Guest Designers, Connie Mercer and Megan Aaron. 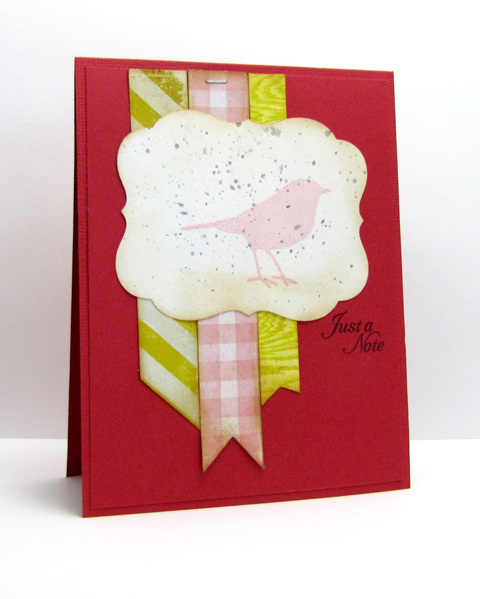 My simple card today features the awesome silhouette bird from Skipping Stones Design's Garden Kiss and a sentiment from Heartsong 2. 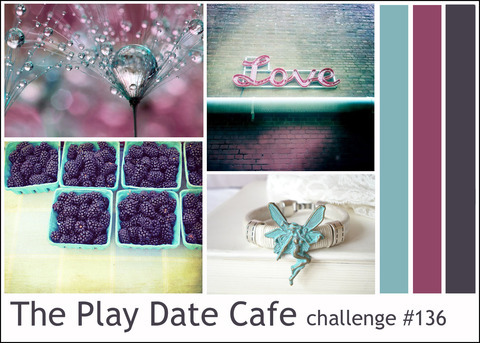 I think the card really packs a punch with the colors based off of this week's Play Date Cafe Color Challenge. Keeping myself pretty busy these days and about to go outside to see Red Steaming Hot and Green Steaming Hot...Yep, they are the current members of my family, in the form of a slimy red insect and a green inchworm that my youngest has taken in and kept alive for the past week or so. Ick. Playing along with the Waltzingmouse Sketch Challenge, happy 100 sketches to you!